I am a kefir drinker & a big fan of Lifeway kefir. Lifeway kefir is like a yummy yogurt smoothie with 30 - 35 major strains of friendly bacteria not commonly found in yogurt. So it's way better for you. I don't get nearly enough to my five year old. I contacted Lifeway about their product -"Probugs". This is whole milk kefir in 5 oz, fun, easy to hold, no spill packaging for kids. Probugs comes in three fun flavors - Goo Berry Pie, Sublime Slime Lime, & Orange Creamy Crawler. I asked my monkey to give me his review on Probugs. His favorite flavor is all of them and he wants to buy some for his friends. Oh and I found several empty Probugs packages lying about - so it must be good, kid approved stuff. I tried one and it's Mom approved as well. The bacteria in the digestive system plays a very important role in our health and can easily be thrown out of balance by everyday lifestyle stressors. Factors that can offset this precious balance include: antibiotics (which sometimes kill both "good" and "bad" bacteria), infections (bacterial, viral and fungal), alcohol consumption, chronic diarrhea, travel, a highly processed low fiber diet and stress. Probiotics are the easiest way to help combat these factors, keeping harmful bacteria in check. 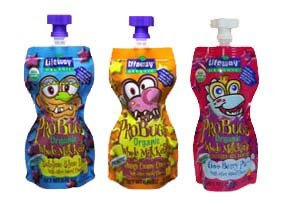 Lifeway Probugs is organic and was made with renewable energy. Not only is it good for you, it's also considerate of the world you & yours live in. It's a product you can feel good about all the way around. Their site has a store locator & coupons so that you can purchase some near you. Or you can enter to win! One lucky reader will win a four pack of all three flavors! Thank you Lifeway for such a great & healthful GIVEAWAY ! *To enter, check out their site. Look through their products and tell me which other Lifeway product you'd like to try. Easy Peasy. Tell me something from the FAQ or Research&Info page that would make you want to add kefir to your diet. This contest will start today Friday Jan. 30th & will end Friday Feb. 6th at 12 noon EST. The Vegetable Cream Cheese spread. Thanks. The mango lassi sounds so good! I would like to try their organic whole milk. i love the taste, but the fact that it helps with digestion is fantastic! I would like to try their SLIM6. I'd like to try the organic pudding. I'd also try the organic pudding. I love the sublime lime slime probug. Would love to try the goo berry pie, I haven't seen that one in our local store. I read the possible health benefits. The one I didn't know was helping immunity. This makes me think it's worth the high price to purchase more often, because I need all the immune help I can get (I have RA). Thanks for the giveaway! Tina Faye is featured on the celebrity page! I am following you on TWITTER....username leahita. I'd love to try there organic rice pudding. Thanks for the giveaway! I learned that Lifeway Kefir is highly digestible and due to its acidity and enzymes, it stimulates digestion of other foods. This benefit appeals to me. I didn't know so many celebs drink their products! Tina Fey is one of them. I would like to try try their organic whole milk. Kefir helps your immune system. I am sorry but Lifeway kefir does not seem to me a complete kefir. I have been into kefir since last five years and recently I was forced to use this brand for want of my own home preparation since after coming to US, I lost the starters of my own. Lifeway kefir taste and contents are incomplete. May be it misses some of the yeasts and other organisms. I think, I will have to make trial and error using different starters to get back my own taste and content.